Your digital advertising efforts revolve around putting out ads on different network, and when creating an ad, you want it to do well and attract new people, right? Well, how can you track who is actually clicking on your ad? It's pretty easy: Just take a look at your click-through rate. Click-through rate (CTR) is the percentage of how often people who see your ad actually click on it. The formula looks like this: clicks ÷ impressions = CTR. Therefore, if you receive 50 clicks with 1,000 impressions, your CTR would be 5%. Thus, the higher the CTR, the better your results will be! 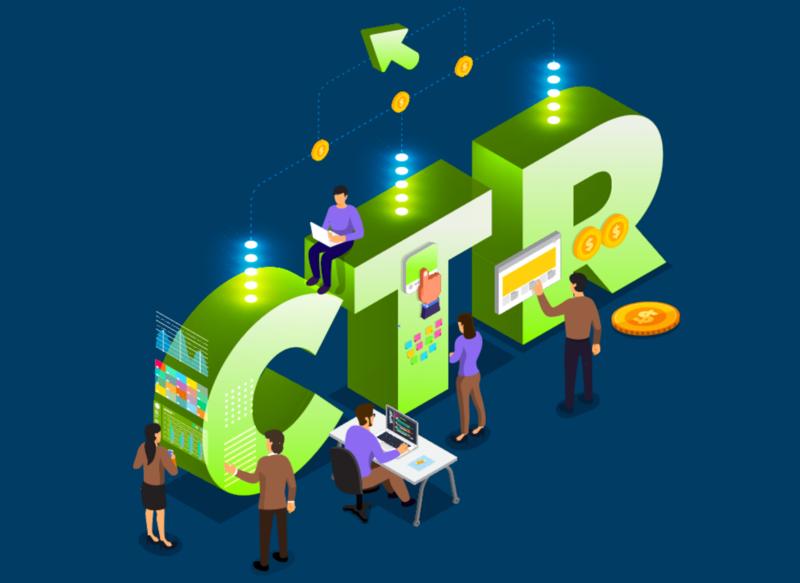 CTR can be viewed on the Campaign, Ad Group, Ads, Keyword, and a few other levels within Google Ads. Analyzing and optimizing for it on each level is very important. Let’s look at a few ways to optimize for CTR. Sitelink – This extension provides users with up to four additional links to drive them to different locations throughout your site. Not only does it give them the opportunity to click on what they were ultimately looking for, but it also takes up additional real estate on the Search Engine Results Page (SERP), pushing your competition further down the page. Call – This extension adds a phone number to display alongside your ad. Location – This extension adds a street address to show up alongside your ad. Here is an image to demonstrate where each of these extensions would be placed on a SERP. Entice your users to take action when reading your ad text. “Buy Now,” “Learn More,” and “Download Now” are all ways to influence users to tack action by clicking on your link and getting to your landing page. Optimizing your ad text is another great way to help improve your clickthrough rates. Here are some key points you should consider including when writing your ad text. This sounds simple, but you want to make sure to include as many keywords as you can to give the user an idea of what they are going to experience on your landing page. Every industry has its own lingo – be sure to include the lingo your audience wants to read or is searching for. If users can catch a glimpse of themselves in your business, they are probably more likely to click! This kind of goes back to CTAs. Make sure you are letting customers know what they can do on your site. This is also a great time to include any special offering you have. For example, if you are a retail and you are having a sale, include “Buy One, Get One 50% Off!” in your headline text. Think about yourself as a user. If you were looking for a new pair of shoes on Google and saw an ad that says they are 50% off, you would probably want to click, too! Make sure your landing pages are relevant to both what the user would be searching for and your ad text. Google takes into account the landing page experience from your website when calculating its quality score, which can impact where you rank on the SERP. If you have a poor landing page, you will likely show up lower on the SERP – and it’s possible that you might get fewer clicks because you aren’t high enough for users to find you. Organize your ad groups based on topics. Sure, it’s pretty easy to have an ad group about football and include all of the football apparel you can offer in that one ad group. However, if you have Michigan and Ohio State football apparel and you include all of it in one ad group, you may inadvertently serve an ad with Michigan apparel to an Ohio State fan. Being a Michigan fan, that would infuriate me! Count me out! Constantly optimize for all of the above and keep everything fresh. If you do that, your CTR should grow fairly consistently. You can improve the quality of your ads in Google’s eyes while providing users with a positive experience of your business!